Computers have become objects of everyday life, you spend long hours in front of our keyboard, and more when it is your work tool. So for its use does not become detrimental to health, there are several gestures to adopt:. 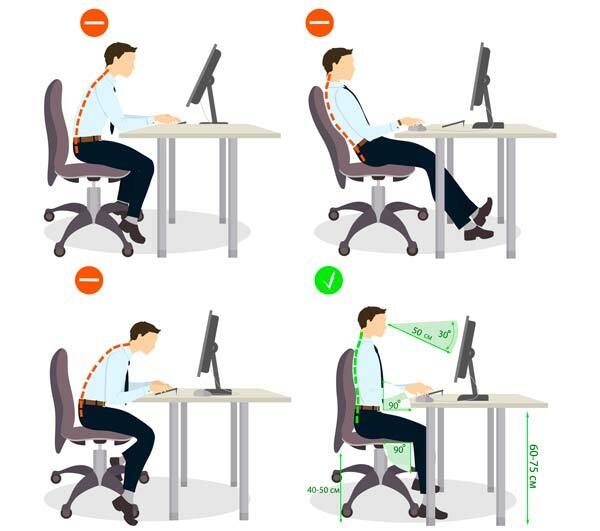 Do not stay frozen in front of your computer for too long, think about taking breaks at least every two hours to stretch and especially to change your dorsal position. The wrist, hands and fingers can be severely affected if you do not take the right positions (tendinitis, carpal tunnel syndrome, DeQuervain’s syndrome, Guyon’s lodge syndrome, tenosynovitis). Rule number 1: never bend the wrists, they must stay in the axis of your forearms. And do not keep your hands in the air, your wrists should be supported at the keyboard. Your elbows must be bent at 90 °. In the long term, you need to regularly change your posture so that your muscles do not stay frozen for too long. Lighting is important, never viewing a screen in the dark that tires your eyes. Adjust the brightness of the screen according to the brightness of the room. If you wear glasses, promote a blue anti-light treatment so your eyes will not be disturbed further. Practice a regular gymnastics of your eyes: by leaving the screen of the eyes and by focusing on an object a few meters away in the room. The screens now use LED bulbs that emit mostly blue light. Our exposure to blue light in duration and intensity can cause symptoms such as eye fatigue, headache, tingling or dry eyes. It should be noted that blue light and more harmful for children than for adults. Previous articleHow to have a faster internet connection under Windows?